Jivelite offers multiple options to shut it down and change its status in general. Through the Webinterface’s Jivelite menu, an additional Power OFF-Button can be added. Here, we explain the functions of each button and where to find them. Firstly, the Power-Button in the upper left corner allows you to shut down the Audioplayer you are operating (in this case, „t3st3r“) and the screen which goes black can be restarted by touching anywhere on the surface again. Secondly, the last menu item called „Quit“, shuts down Jivelite entirely, reverting you to the Raspbian Desktop display. 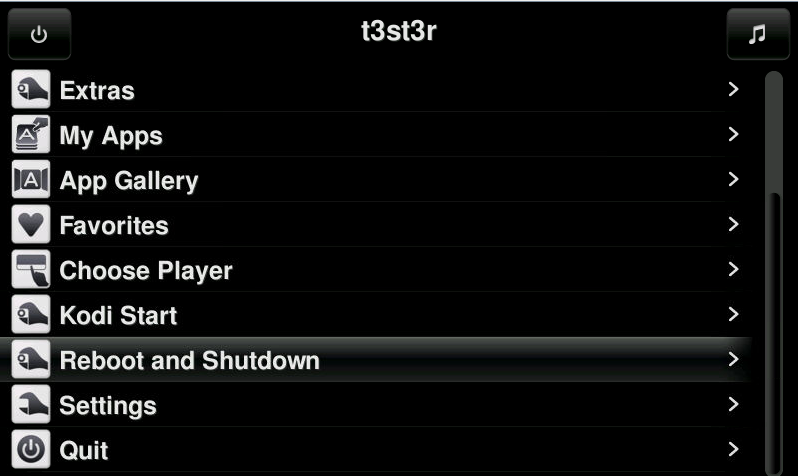 Lastly the „Reboot and Shutdown“ menu, selected in the picture above, lets you shut down or reboot the whole device, including the Pi and Touchscreen.